Posted on November 17, 2011	by Lou Murray, Ph.D.
With only six weeks left in the year (I know, scary isn’t it? ), it is time to start thinking about my gardening goals for next year. Last year, I had hoped to grow 500 lbs of produce. Then, when problems emerged at our new community garden plot, I downgraded that to 300 lbs. But I’m not even going to make that. I should exceed last year’s production of 224 lbs, but not by much. But is that the right way to set a goal for the garden? Picking an arbitrary number? I decided no on that question. I began looking at how much food a couple actually uses during the course of a year. To do that, I turned to figures from the US Department of Agriculture and the US Census Bureau. We live in the city, not on a farm. We can't grow our own grains, dairy, meat, coffee, sugar, etc. An average Americans eat about 1,950 lbs of food a year. Am I going to try to grow that much? No way. Based on figures from 2003, that includes 86 lbs of fats and oils, 194 lbs of grains, 142 lbs of sugar, 195 lbs of meat, and 594 lbs of dairy products. I don’t grow those things. But even in the city, we were self-sufficient in eggs last year, and nearly so this year. I homed in on fruits, vegetables, and eggs, which are things I do produce in my yard. In those categories, we as Americans eat 418 lbs of vegetables, 275 lbs of fruit and 32 lbs of eggs. That comes to 693 lbs of produce and 250 eggs per person. Since there are two people in our household, that would be 1,386 lbs of produce plus 500 eggs per couple. That’s still beyond my ability. And inclination. Our flock consists of a mere three hens: Miss Hillary in front, Henrietta in back left, and the molting Chicken Little in back on the right. We don’t eat that many eggs anyway. At our peak production of 463 eggs last year, we were giving them away. 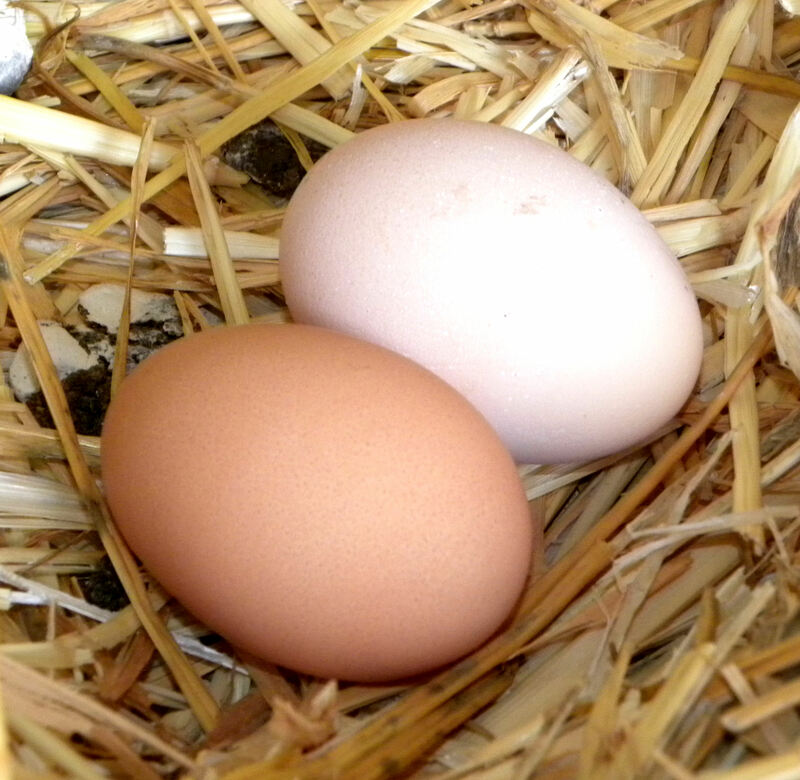 Let’s say that we have eggs covered at our urban farmlet and move on. With 17 fruit trees in back, and 6 in front, we're able to grow a lot of our own fruit even though most of the trees are dwarf. I decided to narrow the produce field even more. Looking at just the amount of fresh fruits and vegetables that Americans eat, and ignoring the amount that we eat frozen, dried and juiced, we eat 23 lbs of fresh citrus, 103 lbs of fresh non-citrus, 47 lbs of potatoes, and 154 lbs of other fresh vegetables. Now that seems more manageable. That comes to a mere 327 lbs per year: 126 lbs of fruit and 201 lbs of vegetables. Because there are two of us, I’d need to grow 659 lbs of produce to be self sufficient in fresh produce. Do I have the space to produce that much? Let’s take a look. I found a range of figures for how much food can be grown per acre or per square foot. 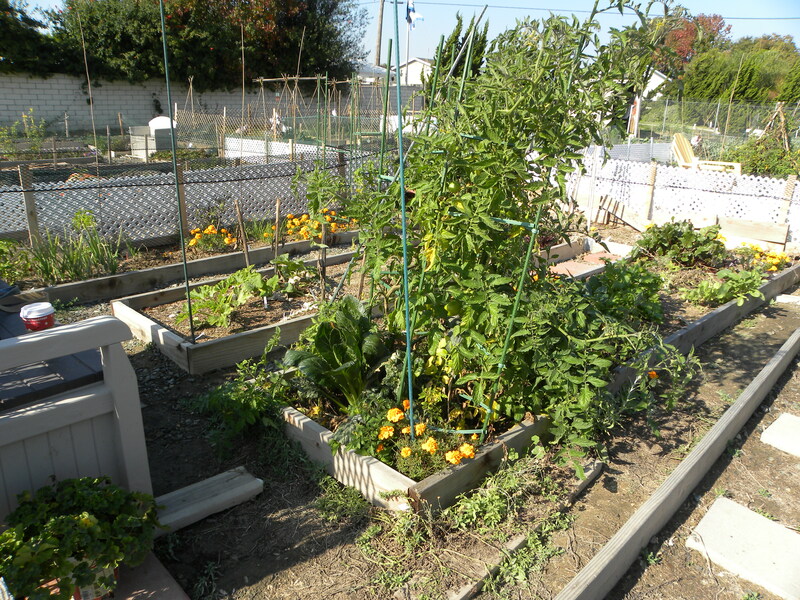 One couple in Pasadena grew 6,000 lbs of food on 1/10th of an acre. An acre is 43,560 square feet, so their tenth of an acre was about 4,356 square feet. That works out to 1.3 lbs of food per square foot. Commercial farmers get about 1.5 to 2.5 lbs per square foot. 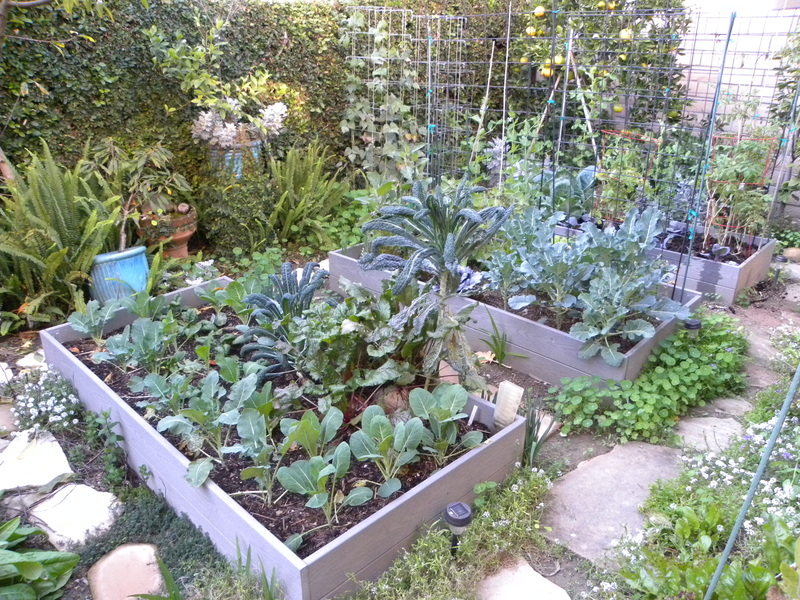 One guy using a process called permaculture gets amazing yields of 3 to 10 lbs per square foot. Of course a lot depends on what kind of crops one chooses to grow and whether or not you can garden year round. Celery has one of the highest yields at 32,000 lbs an acre. Dry beans are among the lowest at 1,400 lbs per acre. 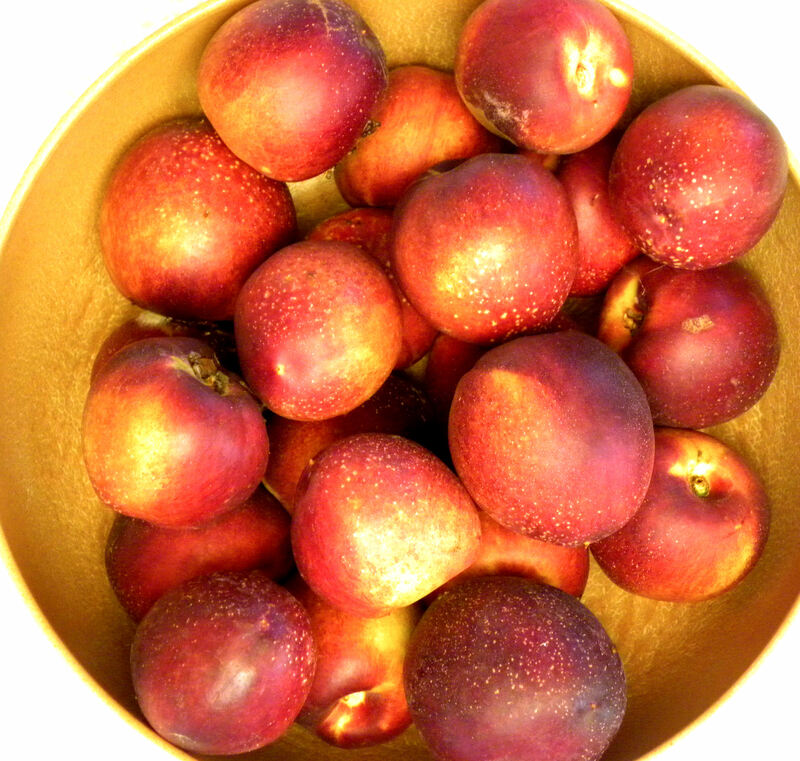 Apples produce 25,000 lbs per acre, with peaches and pears yielding 31,000 lbs per acre. I have three small raised beds in back, surrounded by fruit trees, bean towers, a pea fence and blueberries in barrels. But I don’t have acres. I have square feet. My three raised beds in back have a combined area of 54 square feet. My entire back yard that isn’t occupied by the deck is about 10 ft x 60 ft, or 600 sq ft. In that space, I have a chicken coop and 17 fruit trees, in addition to the raised beds, a couple of bean towers, a pea fence, and a couple of barrels of blueberry bushes. I’d say that my back is maxed out for food production. Fabric Grow Pots are a great way to get more growing space. We grow potatoes and yams in our driveway! 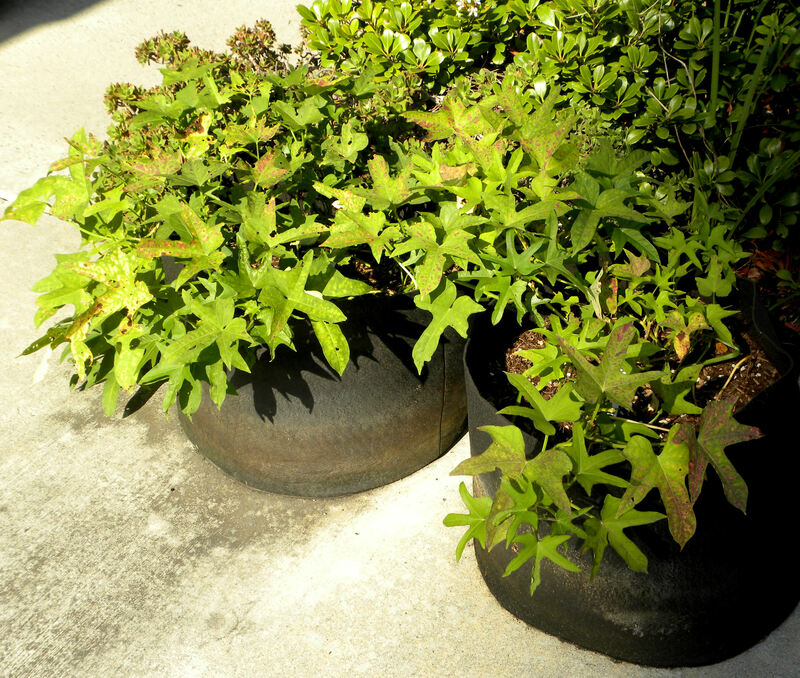 I have five Grow Pots in the driveway, where I grow potatoes in winter and spring and yams in summer and fall. The Garden of Perpetual Responsibility at the side has four artichokes and is lined with pots of horseradish, ginger, green onions, and a strawberry jar. I need to get my Fuyu persimmon planted. Then that area will be finished. 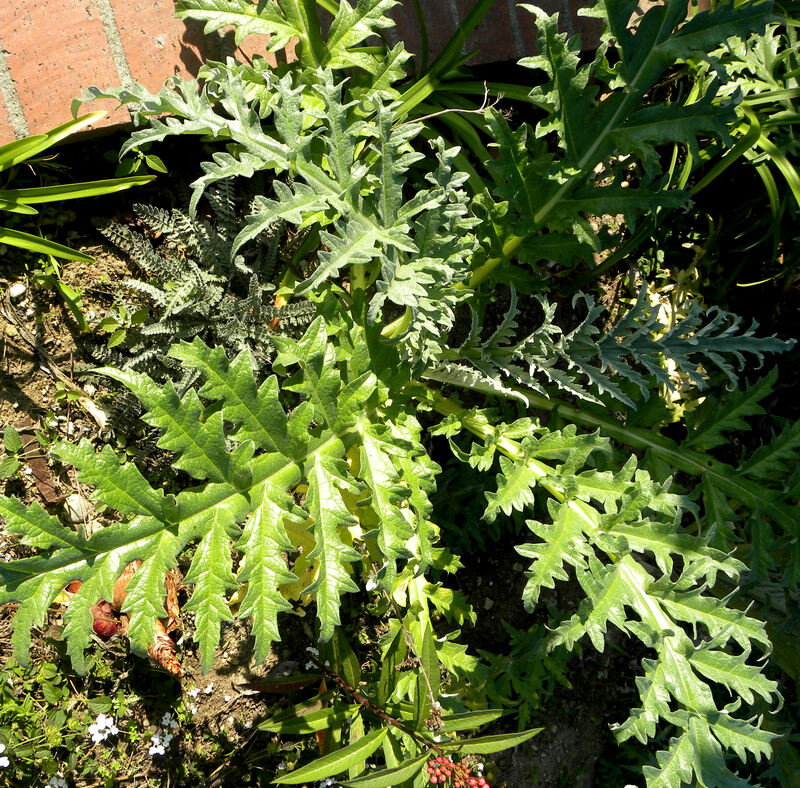 We grow artichokes in the side garden next to the driveway. I need to rework the Garden of Infinite Neglect in front. It has some straggling chard and kale, but that’s it right now. I have plans for raised beds there. My 14 ft x 20 ft community garden plot has pathways and a sitting bench that occupy some of the space. That leaves me only about 160 ft of actual gardening space. My community garden plot is 14 ft by 20 ft. Some of that area is occupied by pathways and my sitting/storage bench. The actual gardening area is probably only 160 sq ft. So that’s what I have to garden in. I’m guessing that’s about 800 square feet total. So in theory, I could grow 800 lbs of food in the space that is available to me. But God help me, I don’t want to process that much food. I think I would be happy growing half the produce we need, or 327 lbs a year. That leaves room for bananas and pineapple and others things that we can’t grow. So that will be my goal for next year’s garden: 327 lbs of produce. That’s a hundred pounds more than I grew this year or last year. If it turns out to be 500 lbs instead of 327 lbs, I would be STUNNED. But happy. I also want our urban farmlet to produce 400 eggs, which is all we need. Last year, we were self-sufficient in eggs, producing even more than we needed. The girls are older this year, so they’re not laying as well. We actually had to buy eggs this month. They don’t lay well in November and December, I’ve learned. I will plan on getting one more hen to make up for the fact that Henrietta will be 4 years old next year, and then we should be totally self sufficient in eggs for 2012. We are self-sufficient in a number of produce items. We produce all the lemons and limes that we need, as well as artichokes, arugula, beets, bok choy, chard, collards, eggplant, kale, Komatsuna, leeks, Mizuna, green onions, parsnips, radishes, snow peas, summer squash, tomatoes, winter squash, and yams.That’s not too shabby. My herb garden produces all the herbs that we could want year round except for dill, basil and cilantro, which are seasonal, and tarragon, which hasn’t grown well for me. I’m still trying on that one. Sage is a short-lived perennial, and needs to be replanted next year. We even have a bay laurel tree in a pot, which gives us bay leaves. 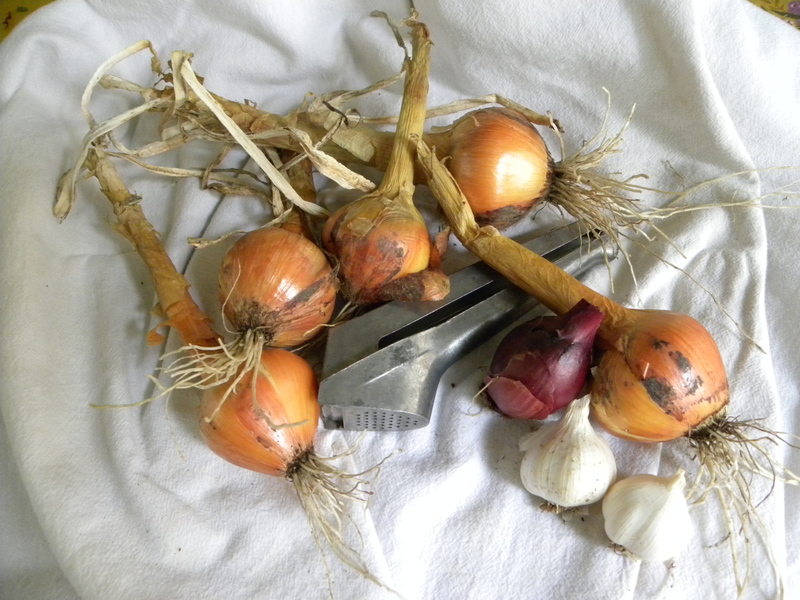 Growing your own onions and garlic is really easy. We can get by for months on our own apples, oranges, onions, peaches, nectarines, cucumbers, bell peppers, and lettuce too. I have four kinds of pickles and four kinds of jams put by, canned tomato soup and sauce, and frozen pumpkin, snow peas and spaghetti sauce. I even have a jar of dried mint for tea and lavender sugar to put on berries. So we have preserved some things to extend the season. Putting by your own jams and jellies is so satisfying. I love seeing all those sparkling jars on the pantry shelves. It's saving summer. 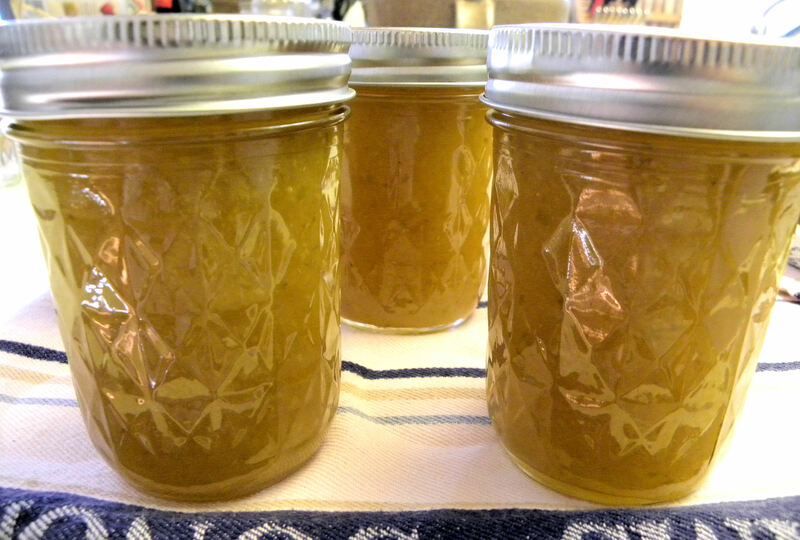 For next year, I not only want a larger harvest, I want to preserve more of my harvest. But most of all, I want to enjoy my garden. I want to relish each day as it comes, and savor the sounds, smells and tastes of my garden. I want to delight in my flowers and native plant garden as well as my food production garden. I will take pleasure in gardening and let it feed my soul as well as my body. All in all, this was a good gardening year. But next year will be even better, God willing and the creek don’t rise. 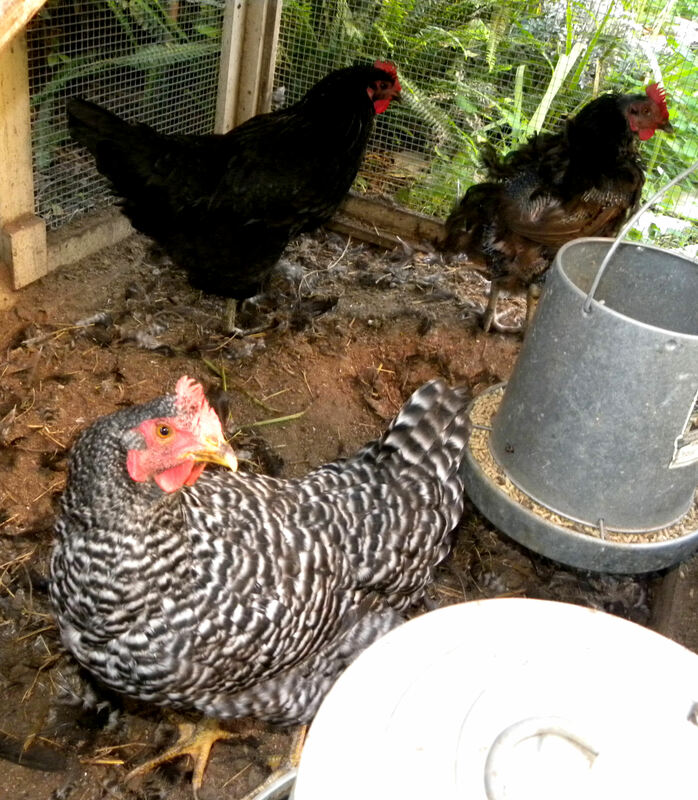 This entry was posted in Uncategorized and tagged acre, backyard chickens, chickens, consumption, eggs, food, Fruit, garden, goals, per capita, productivity, urban chickens, vegetable garden, vegetables. Bookmark the permalink. I really doubt that farmers get 2 lbs/sqft here in the northeast. We don’t have a year round growing season. Personally I always go for one pound per square foot of my raised beds. I usually come close. Sadly we can’t do all our own fresh veggies either. Our winter really shuts us down. Some we can. You can store carrots and onions and such. I can keep my Asian greens alive for a while. But last year I found they really don’t hold well past December without better protection. Maybe some year I’ll get a cold frame. Daphne, I also am wondering about some of those claimed totals. Especially when the highest yield that I found was celery at 36,000 lbs per acre. That’s less than a pound per square foot. But since we can grow two crops here in southern California, it would add up to more than a lb per sq ft, especially if that crop for summer were something heavy, like squash. Bee Girl, my harvests pale in comparison to most of the bloggers whose gardens I follow, but I do love keeping track and setting goals anyway. Wow! Those are some great goals to strive for. I’m jealous of all of your fruit trees. Thank you for doing so much research and sharing it with us. It makes it a bit easier to understand what we should be striving for. Lynn, thanks for stopping by. I just have poundage envy of all those 500+ lb harvests I read about in the blogs of others. I decided to set my own goals and see if I can achieve them. I don’t think average farmers make 1 lb/per sq ft but it might depend on what you are growing and where. Great way of thinking out your goals. Mine personally will be to eat something from the garden every day of the year and to be growing all of the vegetables I eat before the end of the year. It will be several years before I can get there with fruit, especially apples, which in the winter I eat between 5 and 10 pounds of fresh apples a week. Wow, Mary, that’s an ambitious goal. You must have more land available than I do.